St. Vincent’s Chilton Hospital, completed in October of 2016, was designed as a replacement hospital for the original facility that closed its doors in 2012. This three story full-service community hospital houses a 24-bed Medical/Surgical unit, 6-bed ICU unit, surgical suite, endoscopy procedure rooms, 24/7 emergency department, diagnostic and women’s imaging suite, physical therapy department, and outpatient clinic. 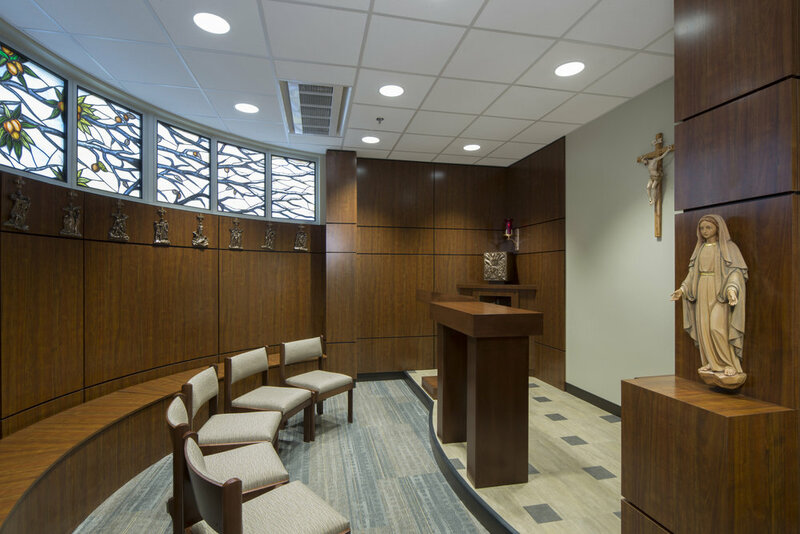 The unified goal of the Chilton County Health Care Authority and St. Vincent’s was to provide faith-based, state-of-the-art, medical care to this previously underserved county. The majority of the hospital's employees are residents of Chilton County and therefore have the special opportunity of providing care and resources to their neighbors. Fulfilling its original design intent, the hospital has become a landmark for the community. Many spaces in the facility were specifically designed with community inclusion and social gatherings in mind. The main reception area flows into a communal lounge and dining room with clear views to the surrounding landscape. Visitors are welcomed with warm color palettes and elemental textures of stone and wood. Organic graphics in the shared training center and throughout the hospital reinforce the agricultural legacy of the county. The chapel invites nature into the heart of the facility and its visitors with stained glass interpretations of the local peach tree across the seasons. 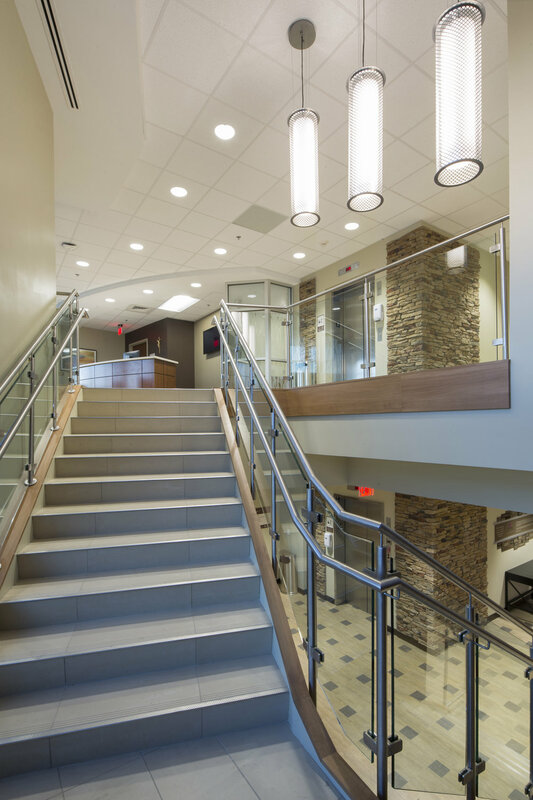 Arriving at the second floor via the grand stair, the surgery waiting area is the focal point of the campus when lit in the evenings, and provides a quiet respite with its panoramic views during the day. 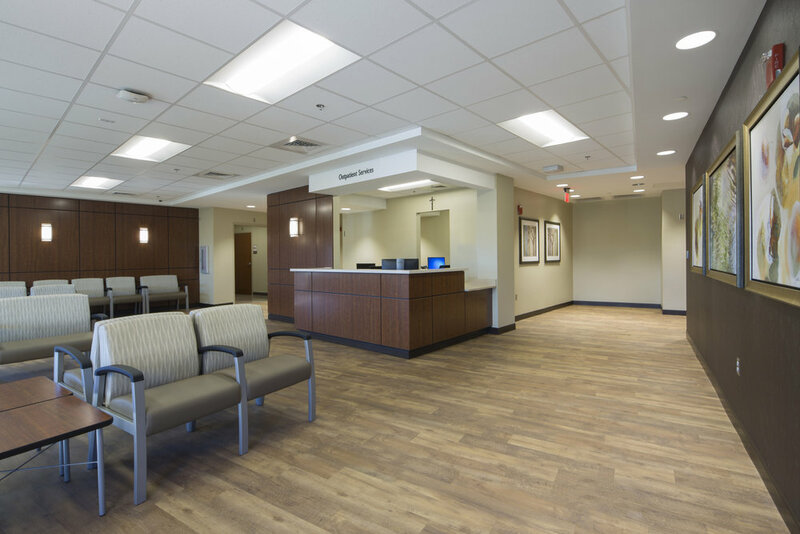 Using calm colors, natural daylighting, and an efficient layout, patient rooms were designed with both the patient and family-centered care in mind. To achieve the goal of maximizing overall energy efficiency and minimizing the hospital’s impact on the environment, cutting-edge technology and techniques were used in the design and construction of the facility’s mechanical, plumbing, and electrical systems. The building envelope was designed to minimize and prevent energy loss, allowing the building’s systems to operate more efficiently. Hydronic heating and cooling - achieved using chilled beam technology - improves air quality throughout the hospital and especially in patient rooms by bringing in fresh air and limiting recirculation of contaminated air. 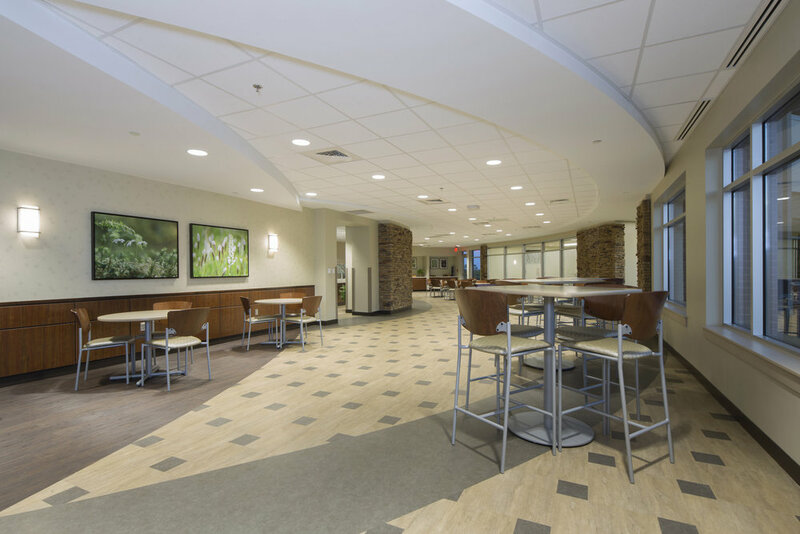 Energy saving and energy recuperating components were incorporated into the design to reduce the load on the hospital’s electrical and HVAC systems.